Yew Tree Cemetery was the second of the two Roman Catholic cemeteries that were opened in Liverpool in Victorian times. It took its first burials in 1893, more than thirty years after the one at Ford, near Litherland. The cemetery is named after nearby Yew Tree Lane, which itself derives from Yew Tree Hose, so named as a large yew tree was in the garden. Yew Tree Cemetery is administered by the Archdiocese of Liverpool and every July an outdoor mass by the Archbishop of Liverpool is held in the cemet ery, when hundreds attend to pray for those who are buried there. The cemetery contains the graves of numerous priests and nuns, buried either near the chapel or alongside the main roadway. There are 35 First World War graves at Yew Tree Cemetery, thirteen of them marked by two small memorials. There are also the graves of 65 servicemen from the Second World War in various parts of the cemetery. Mary McCartney, mother of Beatle Paul, is buried in Yew Tree cemetery. She died in 1956 from complications that arose as a result of breast cancer surgery when Paul was just fourteen years old. Another grave with an entertainer connection is the unmarked burial place of Archie O’Neill, a music hall entertainer known as the ‘one legged dancer’ who died in 1959. A heartbreaking grave is that of Nigel Pickup, who at eight years old was the youngest victim of the Ibrox Stadium tragedy on 2nd January 1971, when 66 football fans were crushed to death on a stairway at the end of a Rangers v Celtic match in Glasgow. He had been taken to the match by his grandfather who was visiting relatives there and in 2010 his grave was rededicated in a special ceremony attended by many Rangers fans who had come to Liverpool specially for the service. Next to the chapel at Yew Tree Cemetery is a headstone marking all those buried in the cemetery whose graves are unmarked. The chapel, dating from 1893, closed two years ago and has sadly become a magnet for anti social behaviour including alcohol and drug misuse, leading to complaints from local residents. This is despite security being in place and with the Archdiocese saying they cannot keep it safe and secure Liverpool City Council has granted planning permission to demolish it. The wider community has expressed concern at this decision, fearing graves may be disturbed. 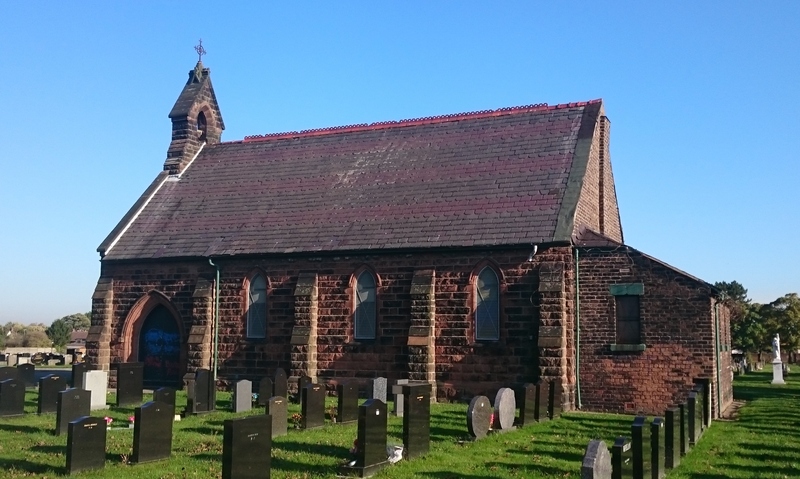 Claiming that it is an essential part of the West Derby Catholic community, and an important part of local heritage, an online petition has been set up which has so far attracted over 1,200 signatures. When looking for a headstone, the temptation is there to search the internet for the best price and order online. However going about it this way can lead to a number of complications arising. Although you may find gravestones on sites such as ebay that seem to offer unbeatable value, you cannot be sure that the memorial you buy will be suitable for the grave for which it is intended. Rules and regulations for cemeteries differ between local authorities so a headstone that could be used in a cemetery local to the seller may be useless in the locality of the buyer. Choosing a memorial for your loved one is a choice that you will be left with for many years to come. It is for that reason that you should use a monumental mason local to where it will be situated. You will then be given personal service by an experienced professional who knows the local cemetery regulations and guide you through the options available. If you live far away from the grave for which you are purchasing the headstone, the mason can email images or send you photographs of the unmarked grave and area around, helping you to choose the most suitable size and material. As well as not receiving such a personal and dedicated service when purchasing memorials from online sales sites, you are very unlikely to receive any help post sale. Even if the price of the gravestone you buy online included supply and fixing, it is unlikely they will come and rectify any problems that may arise later on. Likewise, any remedial work that needs to be undertaken beforehand will not be included, whereas it would be with a local mason. Additio nally if you purchase from a mason, extras such as kerbs, books and tablets can easily be added at a later date that match the existing gravestone. At Sarsfield Memorials the only person you will deal with is Ursula who offers advice, sales, after care and has a genuine interest in quality workmanship at a reasonable price. If you see a price on the internet that you feel is too good to be true then it probably is. We recommend that you contact Ursula who can explain how Sarsfield’s prices compare to those you find on some sales sites and what they don’t include, give her the link of the gravestone you have seen or describe it to her and she will be more than happy to give you Sarsfield’s price including guarantee of quality workmanship from a reliable and renowned family masons. The art of engraving is as old as humanity itself, with the earliest known stone carvings believed to have been made in Indonesia as long as half a million years ago. Stonemasonry is also said to be the joint oldest profession in the world, along with prostitution. However the marking of burial places with inscribed headstones is therefore a relatively modern phenomena, going back ‘only’ three or four hundred years. Here at Sarsfield Memorials we haven’t quite been around that long, although for three generations we have been able to offer a full gravestone inscription service. The lettering can be reproduced in any style you like, with a finish of lead, enamel or gold-leaf, we offer raised lead lettering, cut and leaded, v-cut, incised and sand blasted, these are available for new headstones, adding to an existing one or replicating the original lettering. We always do our best to match up the style, size and finish of a new letter to a pre-existing letter if additional work is required, this also helps our Masons to keep traditional standards going. If you are getting a new inscription then we have a wide range of examples which can be viewed here. Verses are available in a variety of fonts but bear in mind that certain fonts need to be cut deeper into the headstone than others and their final appearance differs according to material and colour of the gravestone. Bible verses and quotes are usually done in italics, while names and dates tend to be bold. If you contact us we are happy to talk you through the options that are most suitable for the material you choose. Depending on what is required our craftsmen will use the traditional methods of hand cut with a hammer and chisel or modern machine cut and sand blasting. Usually when we are adding an inscription to an existing headstone it is done by hand to maintain consistency with the original lettering. When a letter is hand cut, the mason measures everything out on the gravestone with a pencil and ruler then draws each letter onto the stone, before chiselling away the stone to form the letter. Advances in technology mean we now have machinery available that can blast over one hundred fonts, as well as designs and ornamental images, onto your loved one’s gravestone. Incisographs cut letters that have a ‘V’ shaped finish, while sandblasting involves plotting an inscription onto a special tape which is then sandblasted into the headstone. Sandblasting is the most popular method in the trade today but a more advanced method involves using a CNC machine. CNC stands for Computer Numerical Control is a process whereby inscription coordinates are programmed into a computer which then controls the cutting of the headstone material. Not all monumental masons can offer this facility due to the cost of the equipment but at Sarsfield we are able to do so. 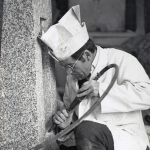 Where necessary, Sarsfield will put a new ground anchor to fix your headstone, meeting all the modern health and safety standards, as well as those of NAMM (National Association of Monumental Masons). If it isn’t possible to remove your headstone to the workshop, we are able to offer solutions for lettering in the cemetery, once we have inspected the memorial we can inform you of your options.Depending on the material you choose for your memorial your Mason should offer you advice as to the style, the process of the lettering and the finish. Different processes work better with different materials, be guided by your Mason. At Sarsfield Memorials Liverpool we share our years of experience and knowledge enabling families to make the right choice. We are the UK agent for an Italian company who produce lettering equipment to the trade Incimar SRL, if you are in the stone industry and require further information on products or consumables from Incimar, then please contact Ursula or Terry at Sarsfield Memorials. In the last couple of decades the adding of photographs to gravestones has become commonplace in the United Kingdom, having been a tradition in some European countries for far longer. The most strai ghtforward photographs are those that are on ceramic plates which are then fixed to the headstone. The image of your loved one that you choose can be one of them enjoying a drink, engaging in their hobbies, or a professionally posed photograph. Digital image enhancing software allows for the quality of faded photographs to be improved or backgrounds to be altered (for example if there is another person in the shot). After the enhanced image is printed on to the ceramic, it is kiln finished to ensure it can withstand the elements. Laser etched images are etched into the stone and bring out a great deal of detail, so for this reason the photograph that you choose must be of a high quality. In this instance, the process involves etching away the polished surface of the headstone so that the lighter coloured rock underneath is uncovered. A high resolution grayscale image is then left on the gravestone. 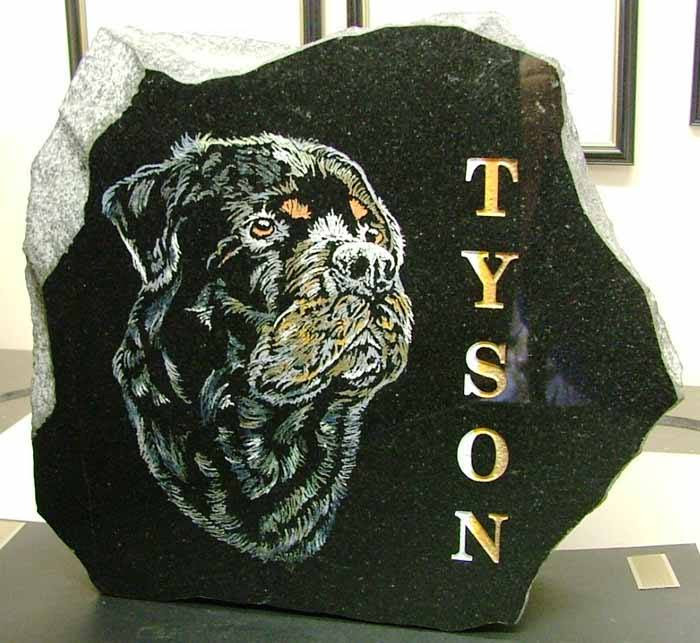 As such the most suitable material for laser etched images is black granite. It is possible also to etch images onto existing gravestones. To do this they will be removed to the workshop for the process to be carried out. Sarsfield Memorials are able to add photographs to new headstones that you purchase, or ones that are already in existence. However, please be aware that many churchyards do not allow photographs to be placed on family gravestones. 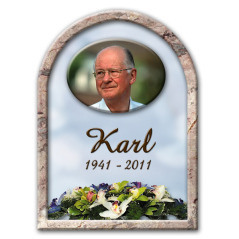 As well as the two most common methods Sarsfield Memorials can offer traditional Italian resin (plastic) photo plaques which can be drilled, dowelled and fixed onto the headstone. By using this method it means they are more difficult to remove, less likely to fall off and this material is also very difficult to vandalise compared to ceramic, which can be easily smashed by stone throwing. Whether you go for a ceramic plate, laser etched image or resin plaque for your loved one’s gravestone, any printed photographs that you provide to us are not destroyed in the process and we always return them. If you would like to discuss adding an image to a headstone, please contact us for further information and a free no obligation quote. Everton cemetery is actually situated in Fazakerley, more than three miles from the historic centre of Everton. The reason for this is that in 1876 the overseers of Everton parish determined to buy a sufficient quantity of land so that they had an exclusive area for burials, rather than rely on Liverpool’s Anfield cemetery. After an extensive search, they settled on 54 acres of farmland that were purchased from Mr Woodward for £12,000. Preparation of the land began in August 1877 but a severe frost in the winter of 1878-9 delayed work and it was not until 16th July 1880, some months behind schedule, that the Church of England section was consecrated by the Bishop of Liverpool, the Roman Catholic consecration following five days later. A man who was on the vestry board that oversaw the development of the cemetery and then played an important part in the history of both Everton and Liverpool football clubs is buried there. Brewer John Houlding lived in a house overlooking Stanley Park, which led him to develop an interest in Everton who played there from 1878 to 1883. After spending one season at a field off Priory Road, Houlding arranged the lease of a piece of land that became the Anfield football ground and Everton’s home from 1884 to 1892. A dispute then arose over rent and the board members voted to move to a new ground at Mere Green which was renamed Goodison Park. Left with a ground that he now owned but no team Houlding formed Liverpool Football Club. Houlding died in 1902, a year after Liverpool had won the first of their eighteen league titles, and by then relations had thawed after the acrimonious split and players from both clubs carried his coffin at his funeral. Houlding was then interred in a family plot at Everton Cemetery. In August 1914 a man looking for an escaped canary stumbled upon a tragedy at Everton cemetery when he found the bodies of two lovers. They were identified as William Holden and Ethel Frost, both of whom were deaf and had been intending to marry. However Ethel became friendly with another man and in a fit of jealousy William cut her throat with a razor blade before taking his own life. Anther murder victim buried in the cemetery is George Walker, an 82 year old who was battered to death in Warbreck Moor in 1953 in what became known as the Old Curiosity Shop Murder. His killer, twenty year old John Todd, was hanged for the crime. In the 1st World War nearly 700 American servicemen who died whilst in Liverpool hospitals were buried at Everton cemetery. However after hostilities ended their remains were exhumed and either reburied in Brookwood American cemetery in Surrey or repatriated to the United States. Compared to some other cemeteries in Liverpool there are not so many war graves, with 55 from the 1st World War and fifteen from the 2nd World War. In 1997 an unusual exhumation took place at Everton cemetery when the head of Yagan, an Aboriginal warrior was exhumed. A bounty had been placed on him after he killed several white settlers near Perth in Western Australia and after he was shot dead in 1833, his head was sent to London and eventually found its way to the Liverpool Museum. After being held in storage for a century it was buried in an unmarked grave in 1964 along with a Peruvian mummy and a Maori’s head. Aboriginal elders lobbied for its repatriation but this was complicated by the fact that twenty stillborn babies and two who had died soon after birth had been buried above it. With it being impossible to get permission from all 22 next of kin to disturb the remains, a six feet pit was dug alongside the grave and then Yagan’s head was exhumed horizontally. Even then the ordeal wasn’t over, as arguments over the most appropriate place form his burial in Australia meant this did not take place until 2010. There are three distinct sections at Everton Cemetery- Church of England, Roman Catholic and General. Within the General Section is a dedicated area for Chinese graves and there is a memorial there to all Chinese people who have died in the United Kingdom. Every Spring and Autumn group visits are arranged to the cemetery by the Liverpool based See Yep Association, which represents the interests of those community members originating from the South West of China, to pay their respects. There are not too many notable burials at Everton Cemetery but one significant grave is that of Brian Epstein, the manager of The Beatles who died in 1967 at the tragically young age of 32. Everton Cemetery remains open to burials today. The main gates and stone piers at the Higher Lane and Long Lane entrances to Everton cemetery are now Grade II listed, being inscribed 1879. Also listed are the three lodges and one surviving chapel of the three that were originally built.